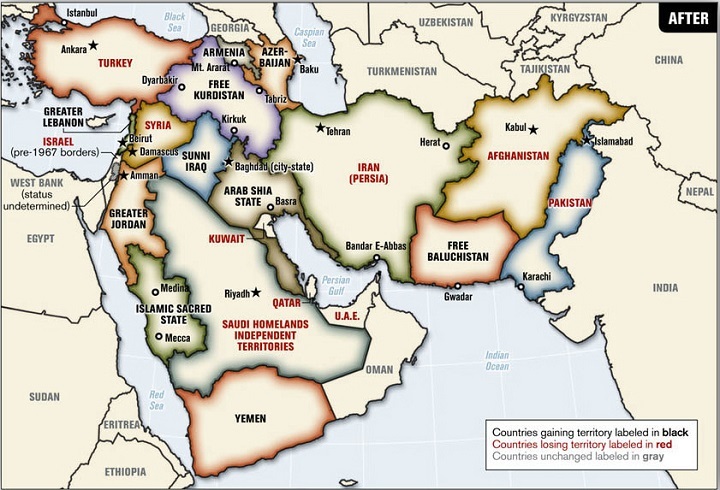 The map above is a 2006 proposed plan to redrawn the borders of the Middle East by Ralph Peters, a retired United States Army lieutenant colonel, author, and Fox News commentator. It was original published in the Armed Forces journal in an article titled Blood borders: How a better Middle East would look. Israel: Returns to its pre-1967 borders. Turkey, Syria, Iran and Iraq All lose territory to create a Free Kurdistan. Free Kurdistan: New state created for the Kurds. Greater Lebanon: a reborn Phoenecia that also gains territory at the expense of Syria. Greater Jordan: gains territory at Saudi expense. Sunni Iraq: One of three successor states to Iraq, this one would obviously be primarily Sunni. Arab Shia State: Another sucssor state to Iraq, would house Iraq’s current Shia population along with gaining territory from Iran. Islamic Sacred State: A new state that would act as an Islamic Vatican carved from Saudi Arabia. Saudi Arabia: Loses territory to Jordan, Arab Shia State, Yemen and the Islamic Sacred State. Yemen: Gains land from Saudi Arabia. UAE: Loses territory to Arab Shia State, although Dubai likely to remain an independent playground for the rich. Kuwait and Oman would retain their current borders. Azerbaijan: Gains territory from Iran. Iran: Loses land to Kurdistan, Arab Shia State, Azerbaijan and Free Baluchistan but gains territory from Afghanistan. The goal is to make Iran even more Persian. Free Baluchistan: New state for the Baluch people to be carved from Pakistan and Iran. Afghanistan: Loses land to Iran in the west but gains land from Pakistan in the east. Pakistan: Loses territory to both Free Baluchistan and Afghanistan. It now lies almost entirely east of the Indus. For a complete explanation why these changes are proposed you should read the original article here. Keep in mind this map is nearly 10 years old and does not reflect recent developments such as the Arab spring, Yemen civil war or rise of Islamic State. well in their case was a little different, everyone was indigenious to the punjab but different relgion, later it gave birth to a free khalistan movement which is famous for the air india bombing. the above map is more on nationalism then segregation. Armenia is a big loser here, should go back to original size in compensation for genocide. Afghanistan shoud be split between a Pashtun part and a Tajik (and others) part. beat me to it on afghanistan. same said about it iran their are many ethinc tribes living in certain areas that are not persian. the middle east should be like europe, where every people has its own nation. The Tajik’s have a country right, Tajikistan? There are more Armenians in Turkey !!! I’m an assyrian. This map is obviously drawn by an Israeli hater of the assyrians who still hold that old grudge in his heart because of the exile and captivity of the ten tribes of israel by the assyrians. That’s why we have no portion In his hypothetical, delusory, fallacious map. They are not idiots. Try to study int. politics idiot! …and they’ll all live happily ever after. Or else they’ll add it to the list of eternal grievances for which they already merrily slaughter each other. I tried to look at this map as a neutral world citizen like it is a demographical ethnic map, even-tough I am Turkish. Now let see the facts. First of all, it shows every strong state in the region is loosing territory. That is not very possible. Also I see my home city in the Kurdistan state. I am originally Georgian like most of my home city where no Kurds live. And from this fact I think there could be some other faults in other parts of this map. And this shows us the man that draw this map is an American who doesn’t really know the realities of the region like those people who signed Sykes-Picot. I think this kind of interventions from outside of the region are not healthy for people who lives there. And those interventions only happening because to gain benefit -just for the outsiders- from new situation of the region. And we saw what happen to Iraqi citizens during Iraqi War or other people in other conflicts (which are interventions by outside). To sum up it is an emperialistic bullsh*t.
What a joke? Afghanistan which is unable to maintain control on its present territory gains both from Iran and Pakistan. Is it a day dreaming or sowing seeds of discord and conflict. It is time to consolidate present states and their territories. really!? KSA is the biggest enemy of Zionists?!!!!!!!!!!!!!!!! and Turkey is the biggest obstacle for the US ?!!!!!!!!!!! Not to mention giving west of Pakistan to Afghanistan and Baluchistan destroys China’s plans for a trade route to the Gawadar port, serving America’s interests in restraining China’s growing economy. And I think China is the biggest threat to the US to be honest. Besides its obvious neo-colonial bias and typical American ignorance, it presumes that different religious, ethnic and language groups cannot co-habit, when reality contradicts this in many other regions. Why aren’t we dividing Britain, France, Holland, Germany, Italy, for example, back into their old, hostile, regions? Because they’ve already been subdued and tamed. The Middle East regions are still independent in thought, culture and language but, barring external meddling, maintain a coherent co-existence. They must resist this imperialist plan or accept subjugation to the West. How about making the Americas more indigenous? In Short Ralph Peter is willing to start a war just to see his Nightmare enforced. 1) The Kurdish people definitely deserve their free state, with special status granted to the Yazidi population as they suffered the worst as a result of not having a Kurdish state (to the Islamic state that is). 2) An Islamic sacred site for all Muslims in Mecca and Medina would be fabulous, as to prevent sectarian violence within Islam (as Sunnis-Shi’ites feud plenty, Ismailis, Sufis, Ahmaddiyas especially, have all been victims of this also), a sacred site with all donations devoted towards secular schools, hospitals etc., would be ideal. Rather than anymore Wahhabi/Salafi mosques for sectarian islamic fanatic indoctrination. 3) An Arab Shi’ite state carved out of the body of Iraq would be fabulous, as they suffered under Saddam Hussein plenty, they will lean towards Kurdistan/Iran, thus adding stability. With Sunni Iraq naturally aligning with Turkey/Syria/Arabia. 4) Jordan has proven itself a secular modern state, providing troops against ISIS, more territory for it wouldn’t be a bad thing I don’t think. 1) The balkanisation of Pakistan halts at Baluchistan, expanded Afghanistan (including the NWSF provinces), and Kashmir under Indian governance. However, I’d suggest as Pakistan is a purist state (Pak- literally means pure, and -stan referring to the “land of,” and thus Pakistan is “land of the pure,” referring to purity from dark skinned idol worshipping Hindus, as their education system constantly reiterates), a complete dismantlement would be ideal. Sindh/Sindudesh should be an additional state carved from the south east, and Punjab, the region from where the concept of Pakistan arose, shall remain the only region where the notion of a Pakistani state may remain. 2) Better give all of the islands under Turkish rule to the Greeks, as compensation for the Greek genocide under the Ottoman empire (which is one of countless, two other notable genocides being the Assyrian and Armenian genocides). 1) Carving out Balochistan out of Pakistan would be tough, but not impossible as Pakistanis are persecuting them, creating a market for Balochistani liberation, and thus fighters willing to join the cause. It is a different story in Iran though, it might not be best to grab Iranian Balochistan just yet. All-in-all, an interesting read, I can’t see I’ve seen anything like it before, but these borders make much more sense than the European-carved out borders, which were designed for the imperial interests of the Europeans, and the Europeans alone. Iraq, Syria, Pakistan, Turkey are all examples of this. The Europeans didn’t even think it through well-enough, because had they done so, having seen recent history, it becomes obvious that sincerely designed borders would have been the obvious course of action as to cause minimal pain/suffering and maximal peace, pride and prosperity. Time to redraw greater Mexico, Smaller USA, Divided Canada maps too. No matter how you draw it, they always will have a reason to complain. Current borders are no good since they were drawn by the victors of WW1 after the Ottoman empire fell. It placed multiple cultures within one country border and the region does not do multiculturalism well. Multiculturalism is forced upon the West by many of them who emigrated, but they do not want it at home. Any attempt from outsiders to redraw the map will result in hostile reactions. So the last solution is that the region decides themselves how to redraw the map, if at all. IF they can do it peacefully, great. If not, let them fight it out among themselves, same way Europe decided on its borders. Without outside interference. Once the dust settles, the natural borders will be decided and everyone can live happily ever after. Agree with your comment completely, but seems like no one is going to give it a shot. I think the underlining idea is right that the some, if not all, the borders of the region need be redrawn but clearly there are lots of inaccuracies which is understandable from an American. An example is the area including Bushehr of Iran, is given to the to-be-born Shia-Iraq while that area is home to some of the most patriotic Iranian people and are not Arab by any definition.